These were found on a Ruby that had been in storage for many years. 1) The linings had been bonded to the shoes without any rivets. Just flicking the lining with a screwdriver caused the lining to part from the shoes. This happened with all eight linings on the car. It now has a new set firmly riveted on! ....so if you have bonded linings check that they are still securely attached to the shoe. 2) The same car. 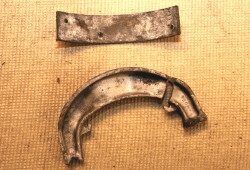 One shoe had cracked and broken and was only held in place by the drum. 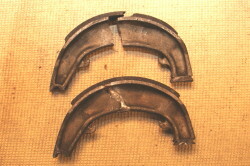 Another shoe had broken in a similar place and been welded up. Not something to be recommended! .....so when you are checking your brakes or replacing the linings inspect the shoes carefully to make sure they have not started to crack. If you find any evidence of a crack starting to develop replace the shoe with an undamaged one. If you can bond and rivet new linings properly then all well and good but otherwise take them to a firm which specialises in Brake Reline. Used and reproduction brake shoes can be purchased from most Austin Seven parts suppliers, see Guide to Parts & Services > Austin Parts. This article, by Andrew Jarmin, originally appeared in Seven Focus, March 2013 p25.